It is a fast paced, thrilling book and pact with if-ics – technologies yet to be invented, which makes it the ideal candidate to start the sci-fi part of my website. The world this book is based on is our world, the one we live in except for one little minor detail there is a ‘little’ very secret federal agency called Bureau of Technology Control (BTC). This agency is so secretive and discrete even the CIA, its mother organisation, doesn’t now it exists. If you never heard of their existence they have done their job to protect you and the society you live in. The story starts when it is confirmed that Jon Grady a synesthetic physicist with a unique perception of reality has invented a gravitation mirror and the BTC seize control over this potential disruptive technology. The book is an awesome read especially because it is pact with well-researched if-ics that blend if-ics based on actual research with fictional science and the transitions between those two is so gradual that the technologies presented feel rather from this world then alien. I will give a run down of some (because I will miss some of them, there are just to many) of the if-ics presented in this book in the spoiler section. I enjoyed the book a great deal partly because of the very nice plot and unaccepted turn of events and all of the presented technologies. So, buy this book and enjoy the read. It was one of the best science fiction novels I have read in a long time. It is not a world-changing science fiction novel but well researched and well written and for a neat sci-fi thriller it goes well beyond the usual genre. The world presented feels real and so do the technologies even thou they are in parts so advanced that they require the Bureau of Technology Control. The technologies presented transform and change in the way that they are utilized over time so that one gets a good sense how disruptive technologies become so world-changing. The only other book I know that shows such a multitude of usages for a single technology is Bob Shaws “Other Days, Other Eyes” (a book review for another time, maybe) a book with the sole purpose of thinking about how a single invention develops and its impact on the world. 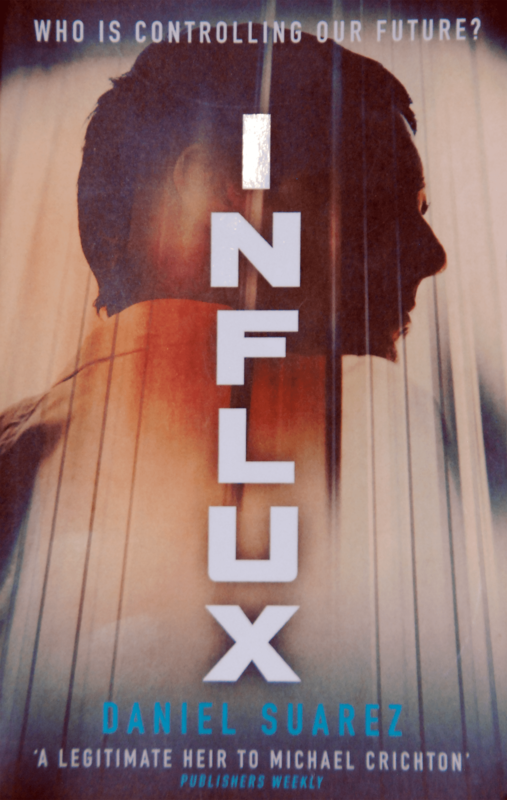 Influx has that on top being an easy to read thriller. Because the technologies are so effortless presented they form the perfect backdrop for the story and also linger with their endless potential much longer in your mind. I have absolutely no idea what this guy looking back over his shoulder enclosed by what seems to be guitar strings on either side has to do with the book. Your guess is as good as mine. Let me know what you think in the comment section or we ask whoever selected this image at random from what seems to be a stock photo image library because it says on the back of the book “Cover image: © UpperCut Image/SuperStock”. That is as unimaginative as its gets. This is only toped by using the same cover image for two separate science fiction novels. At least they were doing something for the environment and of cause for their wallets. Help poor science fiction novelists by submitting your artwork! Can I now show the cover of this book, pleasssssse. It is unbelievable the hoops they make you jump through. This science fiction novel has something that in my opinion every science fiction novel should have and that is a Further Reading section. Not only does it show where some of the ideas for this book spawn from it grounds it also in actual research and show future science fiction writers how and where to get their foundation for their own ideas and imaginations.